Use the MMC850 anywhere where you want to measure current without breaking a circuit or splitting cables. The NEW Megger MMC850 offers a unique solution to current measurement in multi-core cables, without the need to split cores. Simply clamp the MMC850 to a multicore cable and read the current flowing. 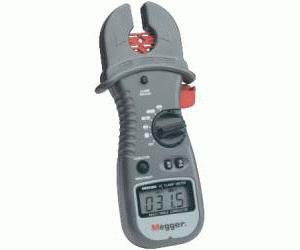 The MMC850 can also be used in place of traditional clamp meters, when commissioning, or for general maintenance work in electrical machinery and installations. A single button switches the clamp between multi-core and single core operation, ensuring the MMC850 is the only clamp meter you need to carry. The MMC850 has a tough and lightweight clamp head, allow good access to awkward locations and cables. The inner jaw clamp centralises the cable to be measured ensuring best accuracy.